UMBC has opened the doors to so many new opportunities. Working on various research projects, participating in hackathons, and learning from my professors at UMBC has been invaluable in shaping my career aspirations. During his years at UMBC, Gaurav Luthria has used bioinformatics to explore a variety of research fields. At an internship at the University of Pennsylvania School of Medicine he studied genetic relationships among ancestral African populations, and at the Health Sciences and Technology Division (a joint initiative between MIT and Harvard) he used social media data to study neurodevelopmental disorders. Here at UMBC, Luthria developed algorithms to elucidate the structure of RNA molecules. As a Meyerhoff and MARC U*STAR scholar Luthria received key mentorship that helped him establish and achieve his goals. He was also inducted into the academic honor society Phi Beta Kappa and the Carson Scholars Hall of Fame, and he received a Barry Goldwater Scholarship honorable mention. Luthria gave back to the UMBC community by serving as a chemistry tutor and genetics teaching assistant. 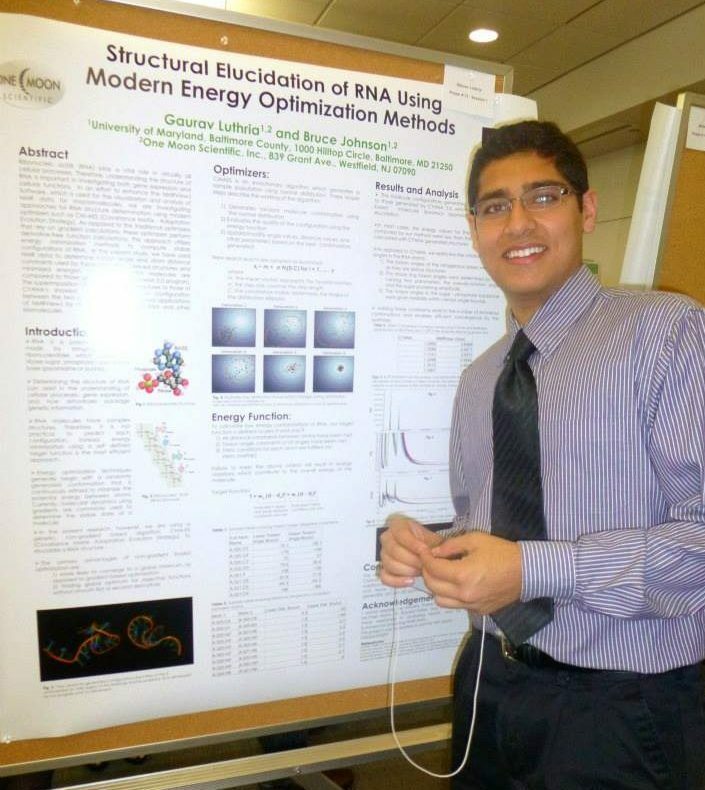 Images: Luthria presents research at the end of his freshman year; photo courtesy Gaurav Luthria. Portrait by Marlayna Demond ‘11 for UMBC.